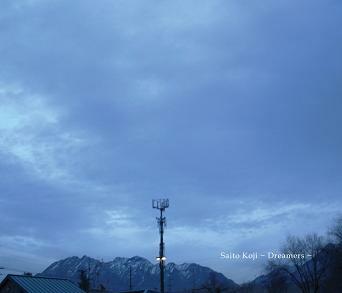 “Dreamers” is an album by Saito Koji, which was released on Somehow Recordings, and today it turns out to be the subject of Agniworld’s discussion. The tracklist organization of this work is quite simple and clear: it consists of two exactly 20 minutes length tracks, which represent the sphere of drone ambient. As I learned from the off-site source of information (Norman Records), this album was written during the Fukushima disaster, and indeed, realizing it, the perception of Saito Koji’s music changes cardinally. Without knowing this, I felt, that it is just a set of serene and pleasant ambiences, but after learning the circumstances of the author’s creation, new sides and new corners became visible. The first track introduces the listener into some kind of prostration and a slight hint of agitation by accordion-like drones, which don’t change a lot during the whole piece, for me it resembles the static gaze into the distant area without an intention to discern anything. Just a prostrated and a little bit trembling gaze. The next part of “Dreamers” is of lower-tone colouring, and if compared with the previous one, it is warmer and calmer, though it continues the former tendency to be static and to have low quantity of audible changes – it is a smooth and stable layer of drone, which, however has some subtle pulse – tardy and measured, as if the space echoes in a blurred way through the dense suspension of glowing particles. I must admit, the both tracks seemed to me a kind of psychic drawing, a steady building of certain moods, as if the music was created when the author’s heart and head were directly connected to the recorder, being the only musical instruments at his disposal. And I think, this connection is rather successful and worth listening to. So, join the “Dreamers” of Saito Koji. This entry was posted in Uncategorized and tagged ambient, drone, Saito Koji, Somehow Recordings. Bookmark the permalink.